This site is now closed and no longer taking bookings. You can book a holiday instead at one of the nearby sites below. A seven-acre site full of ever-blossoming wild flowers and lily-lined ponds, Bloomfield Camping is the stunning result of ongoing dedication, love and passion by its genial owners, Jon and Amanda. Hidden at the end of a single-track lane, the site is home to just four beautiful bell tents, each secluded by budding young fruit trees. As they begin to reveal their hidden bounty, each morning dawns with the picking of fresh, dewy pears to enjoy over breakfast at your own canopy-covered picnic table – utterly idyllic. It's perhaps the sheer space that is the most striking thing about Green Tourism-approved Bloomfield (Gold award, since you asked). 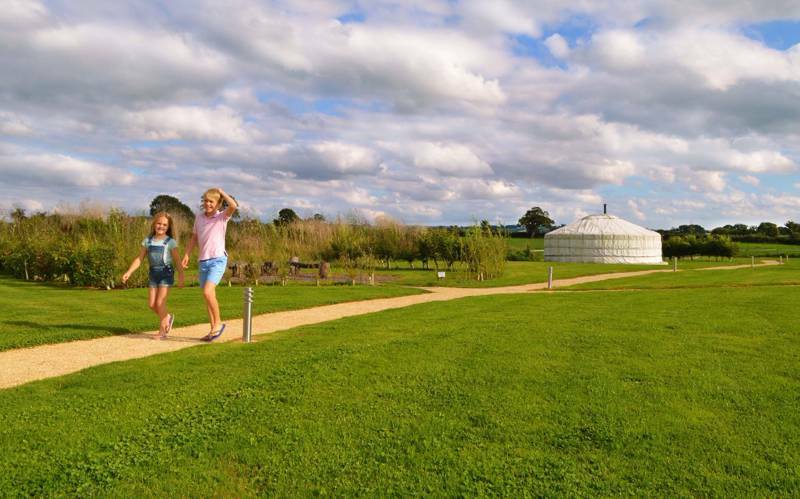 With a maximum of just four families staying at any one time, this is a completely different experience to the more high-density campsites that are common throughout Dorset. With this comes a sense of quietness and calm that helps to characterise this place as a secret haven, hidden-away from the rest of the world. 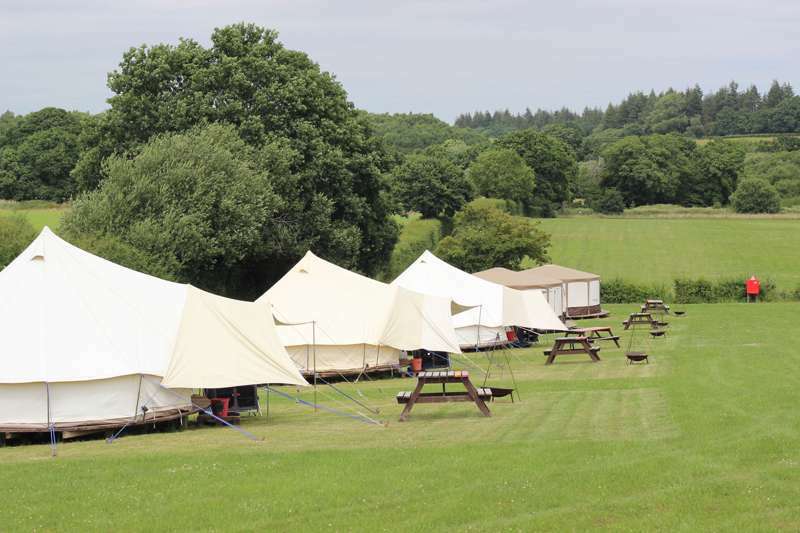 Pitched atop timber decking, each six metre bell tent sleeps four, with a beautiful, king-size oak bed and two chairs which convert in single futon beds. 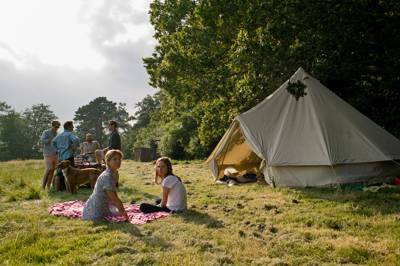 The tents are comfortable, with sturdy oak-framed beds, bedside cabinets, rugs and lanterns; bunting and peacock feathers add a splash of style to the interiors. These homely abodes are clearly well-loved, maintained, and spacious, with ample storage room to tuck away those wellies after a day of rambling in the fields, as you dry off beside the roaring fire pit. Each comes with a kitchenette equipped with everything you could possibly need, from crockery and cutlery to a gas oven and a cool box refilled with newly chilled ice packs every day. It would be a shame for those icepacks to go to waste, so do make sure the cool box is well stocked with plenty of local cider, perries and Dorset wines. The other facilities are pretty comprehensive too; a compost toilet is tucked away in the bushes on the far side of the site and, for those of you who simply can’t be without hot showers and a hairdryer, there is also a brand new, completely solar-powered shower block, just on the other side of the field (complete with two flushing loos, basins and showers and a phone and ipod charging station for each tent). If you wander off to explore amongst the flowers and trees, you’ll stumble upon some exciting finds. Beside the ponds, under a dense canopy of willow branches, a collection of hammocks tempt with the promise of an afternoon nap; children will no doubt be more interested in the rope swings that have been hung from the trees. Wander on a bit more and you may see Dave, the campsite’s resident peacock, strutting his stuff among the long grass. Beyond the site’s gate, you will find tranquil walking paths, beside which wild berries and mushrooms grow in abundance. A climb to the top of the Iron Age hill fort that sits just behind Bloomfield offers the perfect location to enjoy a forager’s picnic whilst looking down upon this special spot. Each pitch has it’s own kitchen unit, canopy with table and chairs and a firepit with grate for campfire cooking. The kitchens are equipped with gas cooker with hob, grill and oven. All crockery, cutlery, pots, pans, washing up equipment, tea towels, cups and glasses are provided (as well as tea, coffee, etc). A large coolbox is provided for each kitchen and ice blocks are exchanged daily. 2 x flushing toilets, 2 x showers and 2 x wash hand basins. There is also a washing up sink. Hair dryer and straighteners for use free-of-charge. There is also an additional waterless/compost toilet on site. Mobile phones/tablets charging available for each tent. Games available (garden darts, quiots, swingball etc). With all of the planting Bloomfield is also a carbon negative site and even offer a tree planting scheme for campers wishing to offset their holiday travel! The Iron Age hill fort of Hambledon Hill is directly accessible from the site, while the ancient settlement of Badbury Rings is just 20 minutes away. For something a little more high octane, one of the country’s best downhill bike centres, The UK Bike Park (07719 335076) and Gorcombe Extreme Sports (01258 452219) are both just down the road near Blandford Forum. For the kids, the Coolplay Adventure Centre(01258 474666) boasts all manner of foamy amusements. Explore the area via the North Dorset Trailway (accessible just a mile from the site) or take to the skies for a bird’s eye view at Compton Abbas Airfield (01747 811767). The nearest, large town of Poole (around 35 minutes by car) is the place to go for watersports activities and the famous Sandbanksbeach. You’ll also find easy access to the whole of the beautiful Jurassic coastline. Gold Hill Organic Farm Shop (01258 861916) sell local organic produce for you to take away and cook in your onsite kitchen – they can even deliver to the site. They also run an organic café providing hearty Dorset meals and a fine selection of local brews. Child Okeford boasts 2 cracking pubs that are just a short stroll from the site – The Saxon Inn (01258 860310) and The Bakers Arms (01258 860260). A mobile fish and chip van stops in the village centre every Thursday. Orders can be phoned through in advance to avoid the queues. For those with more sophisticated pallets, English Oak Vineyards (01258 858205) offers tours and tastings of their exceptional sparkling wines. From the A350, take the exit to Child Okeford. From the village centre, with the shop and the Bakers Arms pub on your left hand side proceed ahead, taking the right hand turn after the war memorial on your right hand side. Follow this road for approximately half a mile passing the Doctors Surgery and Oasis Plant Centre on your left hand side. Carry on for another 400 metres or so and there is a left hand turn into Common Drove. The best indicator of this is a white house opposite on the right hand side, next to the road. Drive 300 yards down Common Drove and we are situated at the bottom of the lane on the right hand side. Nearest train station is Gillingham, 10 miles away. Infrequent bus service. 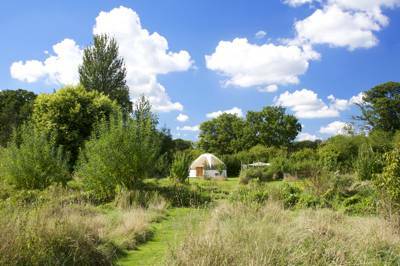 4 large, timber-decked 6m Yurts, each comfortably sleeping up to 4 people.